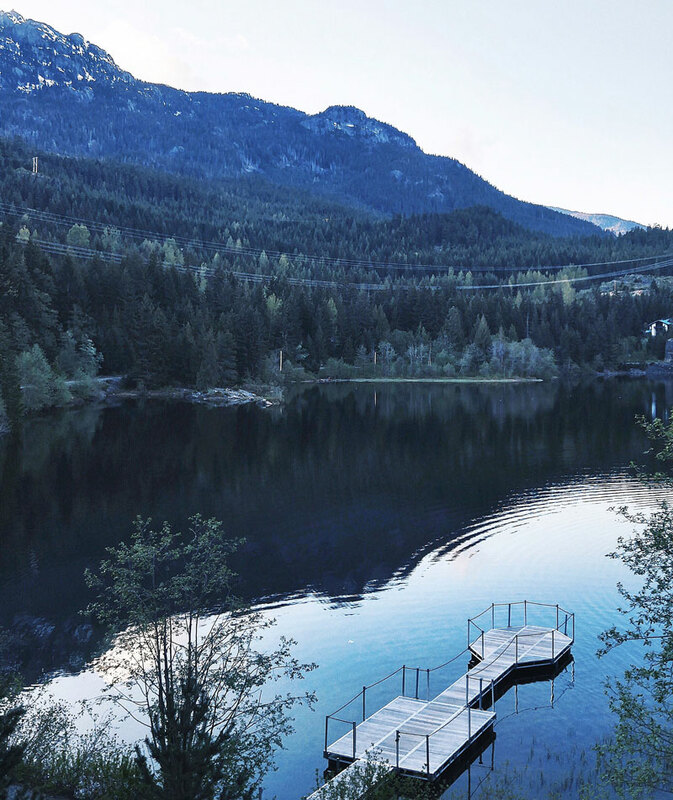 If you guys have been following along even for a few months, then you already probably know I love Whistler. 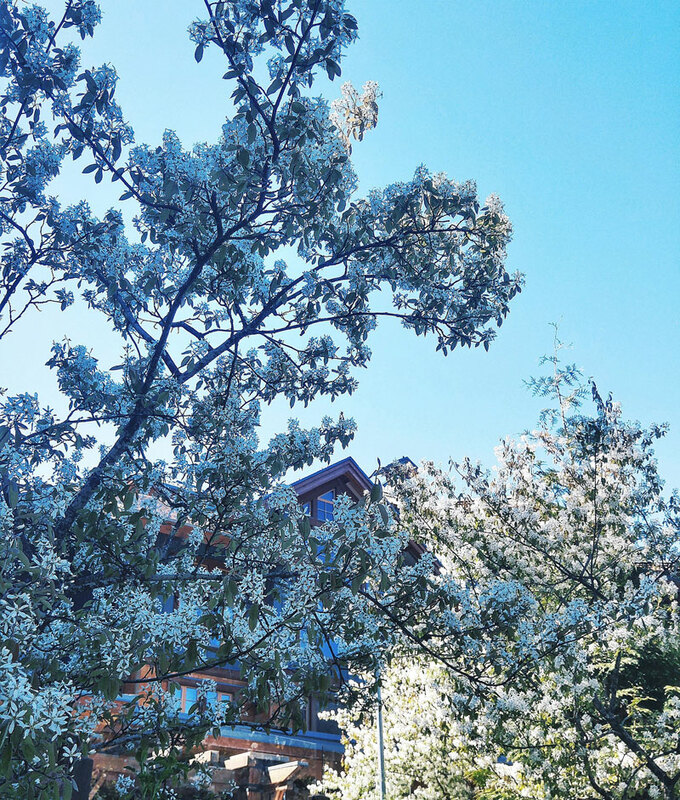 I think I clocked in a record 8-10 trips up this past year – almost as much as I go to my cabin! Whistler is the ultimate West Coast destination (see this post with my other last minute getaway suggestions over here) – with good traffic, it’s just around 1.5 hours to make the trip up from downtown Vancouver, it has world class dining, some of the most incredible natural beauty you could ever see in all seasons, a legitimate playground for the active/thrill-seeking type and an amazing energy throughout the whole town. I’ve stayed at Nita Lake Lodge once before this last trip and was so blown away by the luxury and attentiveness standards the hotel upholds that I knew I absolutely had to come back again. On a combined birthday trip with two of my besties, we did just that and could honestly not have asked for a better celebratory weekend, or a better setting for it! 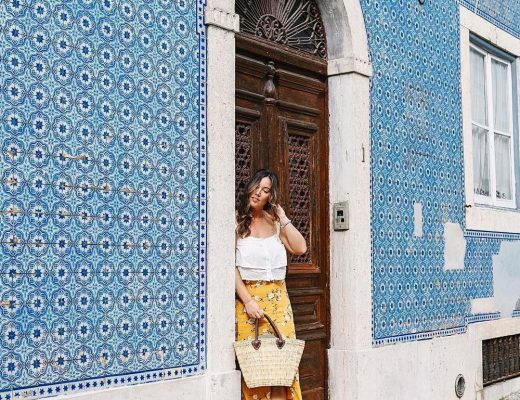 Read on to learn more and to get my tips for a weekend getaway (girls trip or otherwise!). First of all, you honestly can’t go wrong with any of the suites at Nita Lake Lodge. 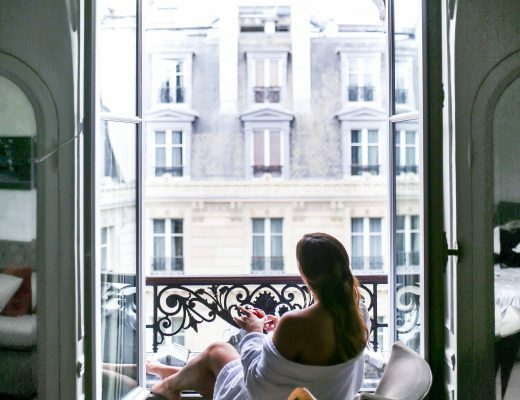 We stayed in a two-bedroom, two-level suite this time and literally had our breath taken away as we stepped in. 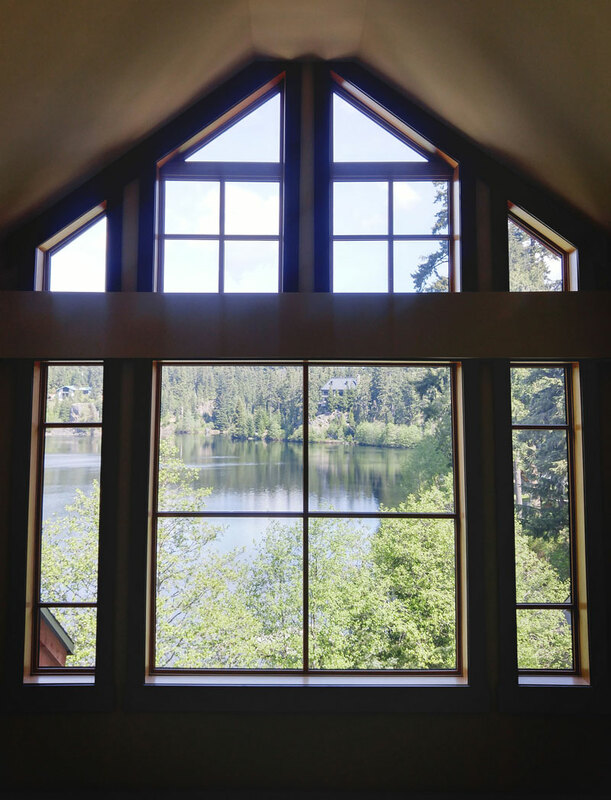 A stunning massive window perfectly framed the beautiful Nita Lake (where the hotel aptly gets its name from! 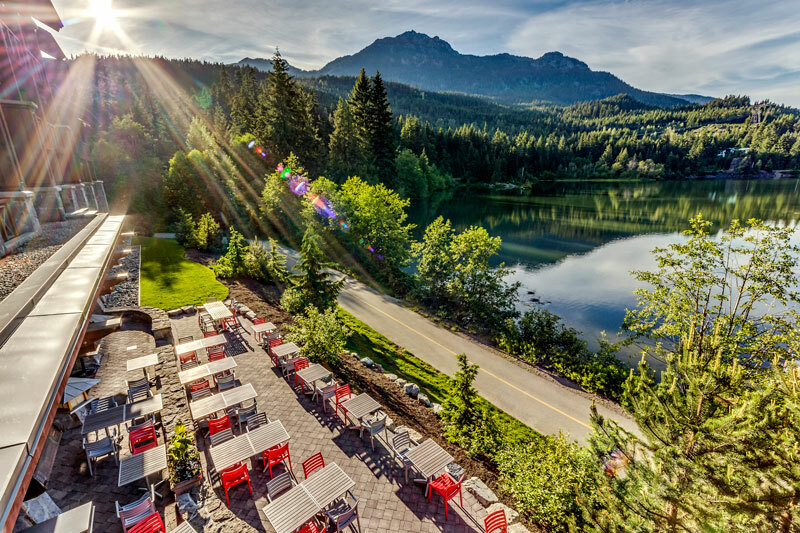 ), through the main bedroom two huge glass doors open up to the coziest patio to catch some of the sun’s rays or watch the fun on the lake below (from canoeing to paddle boarding, and the hotel offers the gear as well which is incredible!). It honestly is the coziest lakeside retreat which is part of the reason I keep coming back. We got in as the sun set down (that’s when I snapped that first moody pic at the top – love watching the lake change at all hours of the day!) and quickly freshened up from our drive before heading downstairs to Cure, quite literally the coziest lounge of all time, to try out some incredible cocktails and their amazing cheese board. Since it was still chilly in the evening, you honestly couldn’t ask for a better setting to sip on delicious gin cocktails (my fave) than being cozied up on luxe leather couches with a huge fire blazing in the centre of the room in this stunning fireplace installation they have. Whether you’re looking for a sit-down dinner or eager to try their famous Sunday brunch (I honestly almost cried once because I got dates mixed up and came on a Saturday when I was staying at a friend’s cabin – it’s that good! ), Aura is the place to go. 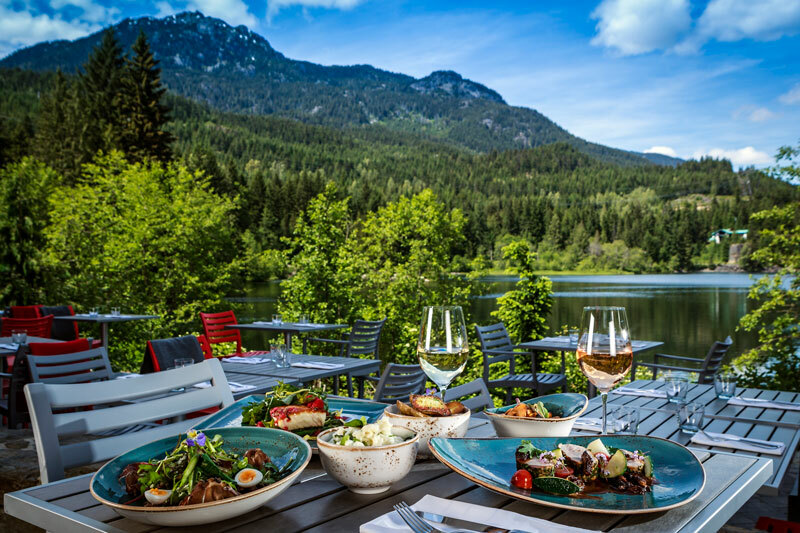 Literally just across from Cure, Aura is one of my favourite places to eat in the whole town, which is quite a high accolade because Whistler has some of the best dining in the whole country, let alone the province. We weren’t able to stop by Aura or Cure’s patios this time during the day but the hotel kindly let me use some of their images (Aura at the top, Cure below – gah!) 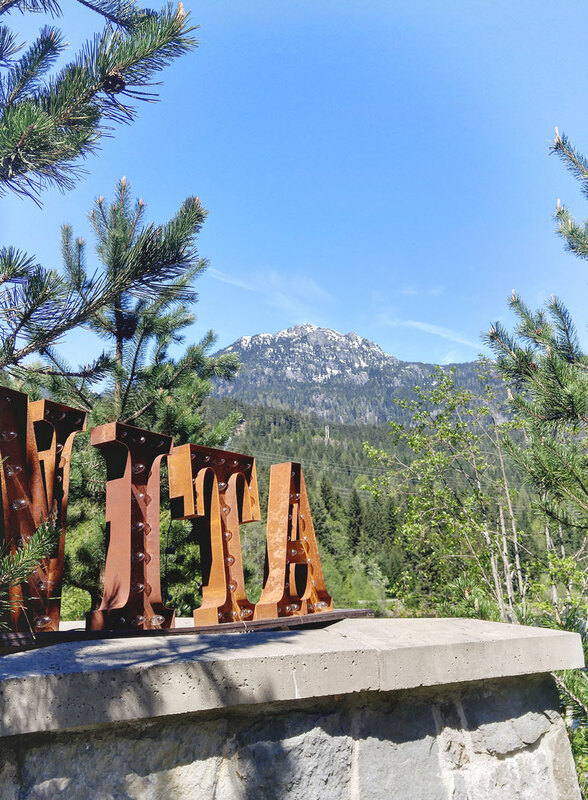 – while Whistler is a winter wonderland, in the summer you can clearly see patio life is alive and well at Nita. That view of the lake!!! It’s an absolute must. 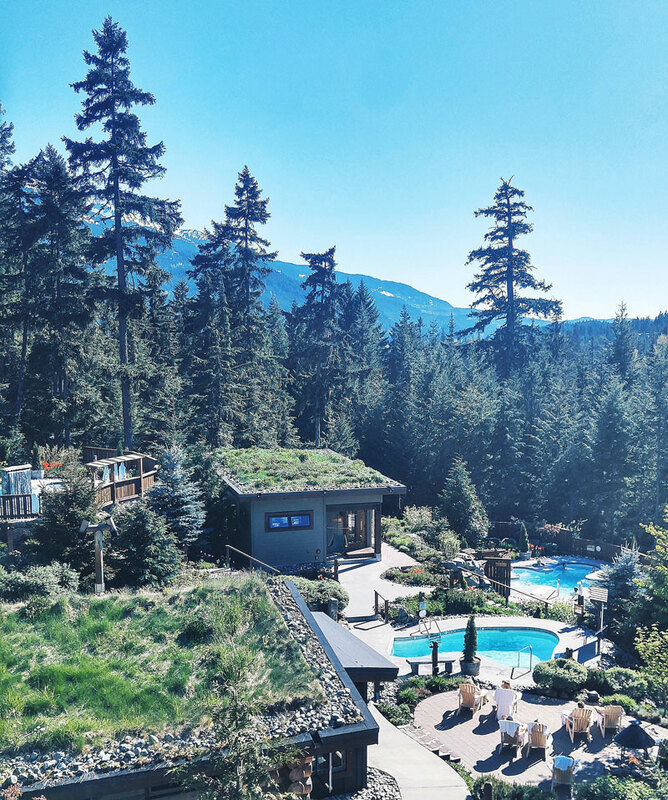 Okay, so you got your suite booked, you’re well fed, you’ve woken up fresh on Nita’s dream beds…time to get outside and enjoy all that Whistler has to offer (and it’s a lot so you’ll have to pick and choose!). 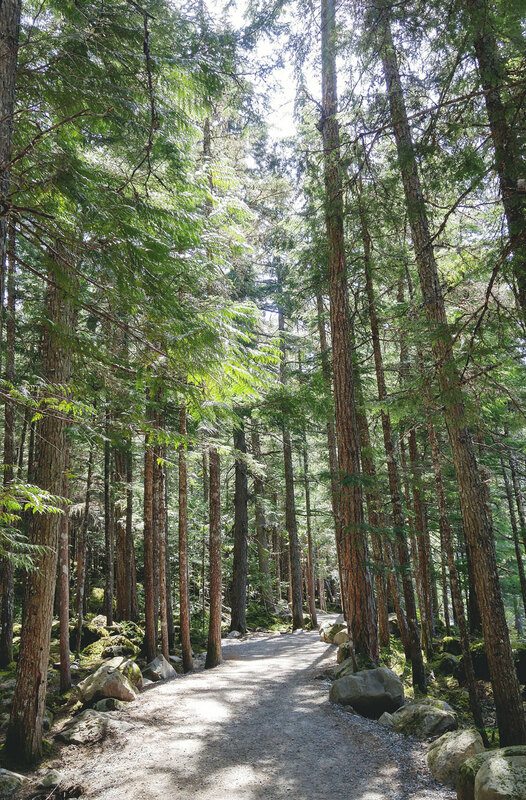 You can go mountain biking, kayaking, lake hopping, etc, but my friends and I are big hikers and especially with my back still in recovery, nothing’s as good for it as a gentle meander through the forest. We stopped by the concierge desk for some new suggestions since from experience, I know the staff at Nita (who are locals who seriously know their stuff) would be accommodating and amazing. True to form, the super sweet Eamon walked us through how to get to Brandywine Falls, check out the waterfall and how we could extend the hike. If you want to check out the waterfall shot, stop on over here. It was unreal. 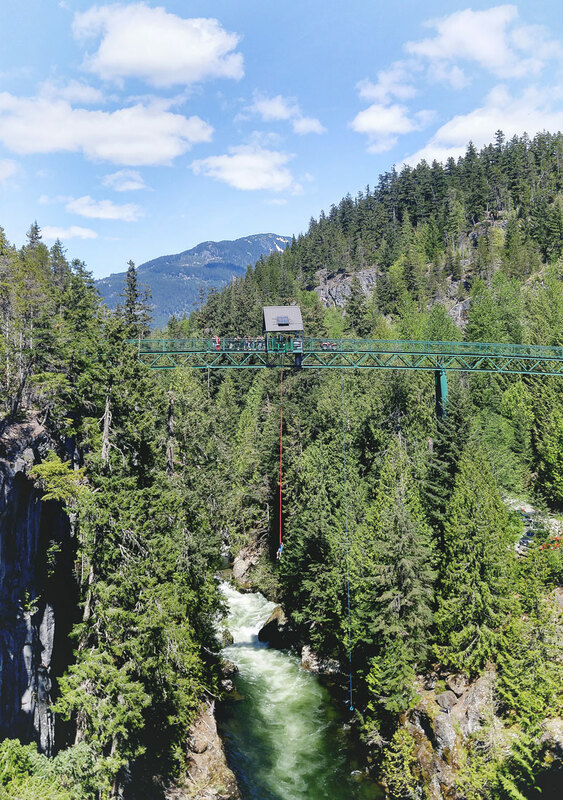 If you kept walking, you’d eventually make it to here…the bungee jumping zone! I actually would love to do this but probably not the best thing for my back right now so we just made friends with some guy watching them (and by made friends I mean I crowded into his personal space and started talking to him). It’s surprisingly an extremely entertaining thing to watch, and oddly meditative too. On my bucket list! And finally, I can’t not go to Scandinave if I’m in Whistler. I was already pretty blissfully relaxed after the amazing weekend at Nita Lake Lodge so Scandinave really just put me over the edge into full zen mode. You need to go and just spend a few hours – trust me, you’ll come out the other end in pure bliss. Again, a big thank you to Nita Lake Lodge for showing me yet again why I keep coming back! Retreat is the ultimate word for it. Tucked away slightly from the bustle of the village (though they kindly offer a super quick shuttle into town! ), you literally feel like you’re in a beautiful lodge tucked away in the wilderness because, well, you are! 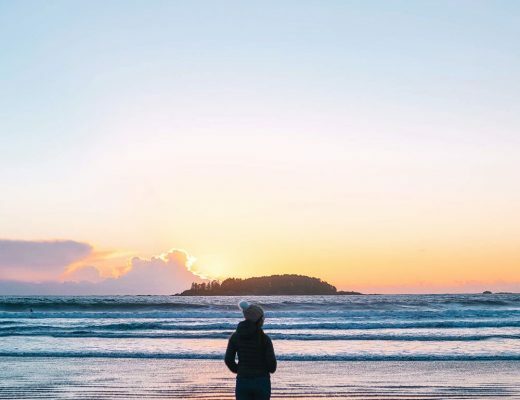 Whether you’re from Van and thinking of a trip, out-of-province and wanting to explore more of the surrounding areas of Vancouver or visiting internationally and wanting a true taste of Canadian luxury at its best, this is it!